How to distribute Quality Manual? Part VII. I had to continue seeking ways to show processes visually. I knew UML2 together with its limitation, and I looked for other standard modeling languages to visualize process flows. I found BPMN, Business Process Modeling Notations. First I read the standard, and I found that very useful. I found BPMN support in Visio, but it was really cumbersome to draw process models. I gave up. Then I started to browse the internet systematically to find support tools for BPMN. Sourceforge did not provide solution, but I found Bizagi Process Modeler. 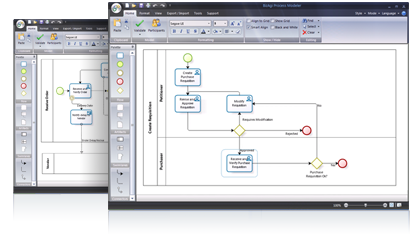 This application is a (free) part of a huge system, what is able to compile and execute the models you create in BPMN. It looked very impressive. Of course I downloaded it immediately and started to use. It was awesome! It knew everything I missed before with other tools! It fully supports BPMN, but lets you to deviate a bit from the standard. Drawing is easy and fast. I really recommend. So, I found the best tool ever to visualize our processes. The question was how I can integrate the pictures with the text, and how the user can browse it easily. I used one of the oldest solution: HTML. I put HTML imagemaps on the pictures I exported from Bizagi Process Modeler and linked them to the appropriate parts of the text. It works well, easy to browse, easy to maintain. I’m satisfied so far, but I’m sure I’ll try other tools if I find any. I’ll let you know if I see anything better than Bizagi Process Modeler.